What do you imagine when you think about self-sufficiency? We believe that the basis of self-sufficiency in Japan is rice. Rice is our staple food, so it has supported our life for a long time since rice farming started. Therefore, if we grow rice by ourselves, our dependence on money will decrease, which may be expected to go localizing and down-shifting your everyday life. Moreover, rice farming has developed along with Japanese culture. Farming knowledge and experience are related to learning our own culture, and farming gives you a great opportunity to look at our life again. In other words, we are inseparably tied to rice. 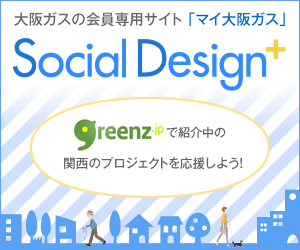 Here, I would like to introduce a very innovative green drinks organized at Matsudo, Chiba prefecture. green drinks Matsudo aims to spread possibility of self-sufficiency and rice farming. Firstly, we need to get used to rice fields because we rarely touch mud in our daily life; we don’t even walk in mud usually. As we get used to mud, we come to enjoy it! After the brief introduction, everyone begins to plant. Planting rice itself is not difficult but monotonous, so they have a lively conversation along with the fresh experience and fresh air. 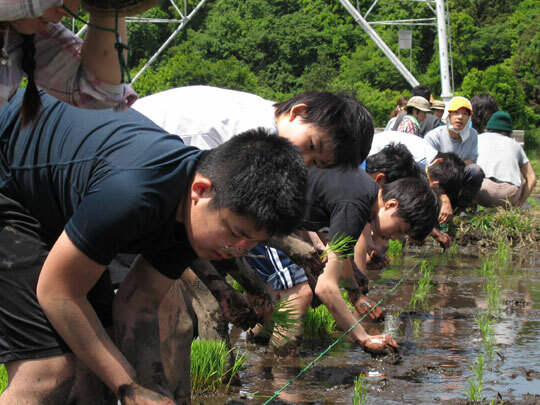 During this rice planting event, junior high school students worked together with other participants. Fresh communication was naturally created across many generations. We can feel a sense of comradeship by doing the same work. As time passed, this monotonous and unaccustomed work makes participants very tired. Through these difficulties, they experience the hardship of planting rice and growing their own food. Sometimes, adults urge students who are getting bored to finish off their work. It is an unfamiliar sight nowadays, isn’t it? They have finished planting rice after long and hard work. The sense of accomplishment is immeasurable!! Though all participants seem very tired, they look so satisfied. After planting rice, it’s the long-waited-for lunch time. The food was brought by the participants, so there were various kinds of dishes such as salad, fried chicken, beans and more! It was much more delicious because they really worked hard! “gdMatsudo” was started by the following members. 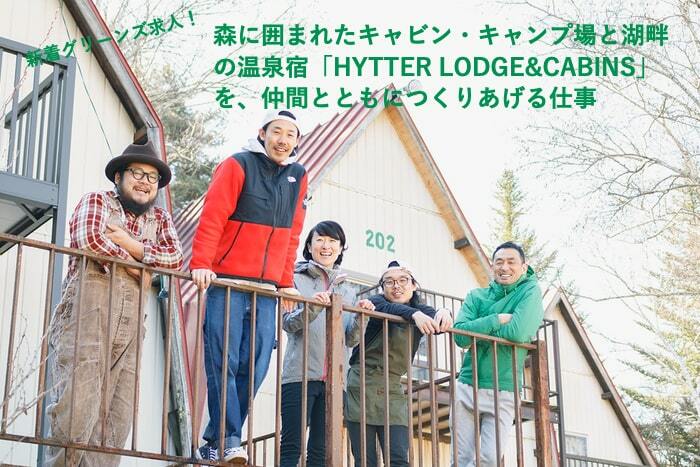 Jun Ito, who is a store manager of Organic restaurant CAMOO, Mr. and Mrs. Saito from HARERUYA Cafe, and Kengo Tonozuka, the organizer of gdMatsudo. This rice field, owned by Ito’s friend in Usui city near Matsudo, was formerly used for farming but had been abandoned for a while. They needed two years to prepare the land for rice planting. Though all of them have a regular job, they did mowing the ruined field for soil puddling. Considering this, it may be possible for business people in today’s society to grow their food while keeping their regular jobs. In 2012, they finally completed rice farming from the harvest. This was a great opportunity to realize how tough rice growing is! Also, how delicious rice made by ourselves is! When everyone does the same work for the same purpose, we can talk to each other and will naturally have the same feelings. Now, we can communicate with someone even if we live far away, because of SNS. Of course, it makes our life more convenient and gives us an opportunity to know each ams time, we tend to forget the real distance from people. Such face-to-face communication gives us down-to-earth relationships between people literally. I hope that various people can communicate with each other by sharing experiences, joy and life. Do you talk to people while you are relaxed in a natural setting? If you don’t have such an opportunity, why don’t you try to plant rice or some other farming activity?